I'm a little worried about myself . . . I'm crafting. I've written before about how I definitely did NOT get the crafty gene. It takes just about every ounce of energy in these tired old bones to get out the glue gun. In fact, I usually have one of the girls get it out for me because, frankly, I don't really know where we keep the glue gun. But a few weeks back, as I was perusing the Williams Sonoma catalog full of beautiful things I drool over but can't afford, I noticed these little cuties. 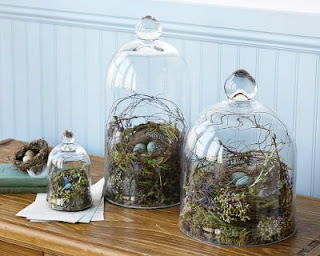 They are sweet little nests made of twigs and moss, filled with little blue eggs, that hide underneath those great glass jars. Cute huh? That teeny-tiny one over on the left hand side is $39 and you can order it if you want. I think I'll take a pass. 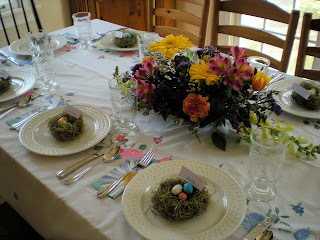 But it got me to thinking about how cute those little nests would be on my Easter table. For some reason, just thinking about it got the crafty juices flowing, plus I got to thinking about what a great mom I would be if I did an Easter craft with my kids, or even one of them, so Maggie and I headed to Hobby Lobby. I bought what I thought would be the necessary supplies, but not entirely sure because, after all, I was making up this craft in my head and I could only guess as to what I would need. Maggie assured me I was doing the right thing, even though my hands were sweating and my head was screaming, "Don't do this! You can't do this! Don't even try!" Well, after surviving that minefield, I was done in, so I left the Hobby Lobby bag sitting on my bedroom floor for, oh, about two weeks. But on Friday, Maggie insisted that we actually try to accomplish the craft we had set out to make. So we did. And I am so proud of our crafty achievement that I just have to share it with you all here. They are just so cute you may want to host a springtime brunch just so you can make these. My talents are quite limited, so we kept the supply list simple. Tiny grapevine wreaths, moss, and hot glue. That's it. See? Even a monkey could do it. Make a flat, round pancake out of the moss. Hot glue the bottom of the wreath and set it on the moss pancake. Put some more hot glue around the sides of the wreath, and form the moss around the wreath, creating a nest. 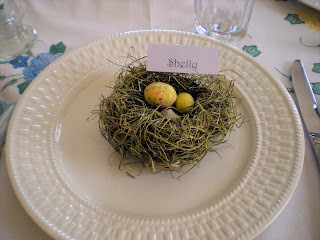 Finally, we filled our nests with candy bird eggs and put a placecard on top of each. Here's a look at my Easter table when everything was finished. It was so Springy and cheerful, and it made me happy. Look at you! You never cease to amaze me. :)- It is officially time to stop the "I don't have a crafty bone in my body" stuff since you completed a quilt last year, and now these egg nests...complete with eggs and name tag. So that will just leave me with the "I don't have a crafty bone in my body" stuff. Maybe someday...considering I lag about 20 years behind everybody in everything else!! Cute! I'm so proud of you! Your table looks great. And your girls probably appreciated an Easter theme. My kids usually wonder why we even have to have a special meal. Of course we are 4-3 guys to girls so when I am really the only girl to care how pretty things look it doesn't get appreciated. That being said, I guess I'm envious of you for being able to decorate your table and someone care about it. By the way, I love your dishes! Your talent is unbridled! Who knows where you will go next, Shel! Maybe you can teach the rest of us your bird craft when we are together. Start working on something for Christmas! Oh my word. I am well impressed. I haven't a crafty gene in me. Not even a desire. Instead, crafts, like scrapbooking, are more like torture! Which doesn't prevent me from recognizing and respecting the craftiness of another. Your table is gorgeous! Christmas, Mom?! Ah, no, I've fulfilled my craft quota for the year. Lisa, I break out in hives when I think of scrapbooking. My older pictures are all filed by date--still in their envelopes, and newer pictures are on the computer. Where they shall stay. Thanks for all the compliments on my table, girls. It was fun! Love this.Love your blog...I'll be back when I have more time! . . .and I may steal that idea for next year. It ROCKED!! !